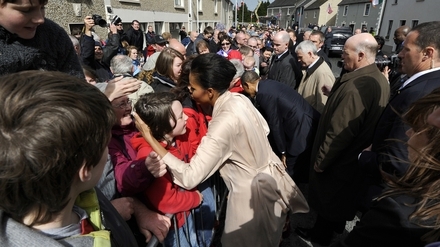 On Monday, 23 May, US President Barack Obama and First Lady Michelle visited Ireland. 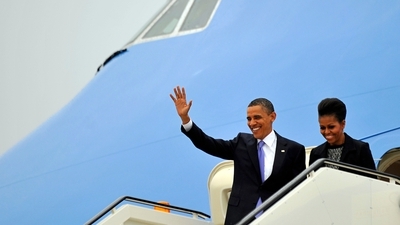 Air Force One touched down in Dublin Airport shortly before 9.30am. The Obamas travelled by helicopter to Áras an Uachtaráin where they met President Mary McAleese and Dr McAleese before meeting Taoiseach Enda Kenny at Farmleigh House. 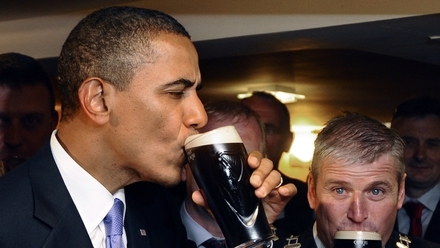 After a visit to the US Embassy in Ballsbridge, the Obamas travelled to Moneygall, Co Offaly. This small village is the ancestral home of Mr Obama and, despite the rain, both he and Michelle shook almost every hand in the crowd before drinking a pint of Guinness in the local. 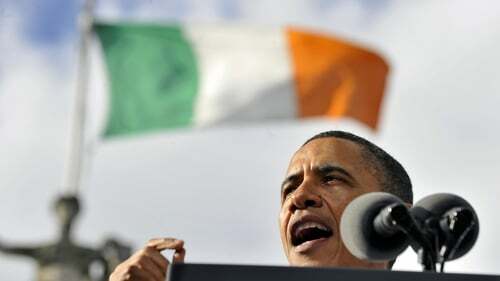 Just before 6pm after a short helicopter trip back to Dublin, the US President delivered a rousing 20-minute speech to thousands of people at College Green concluding with 'is féidir linn' - the Irish version of his 2008 campaign slogan 'yes we can. The Obamas attended a dinner with the US Ambassador to Ireland, Dan Rooney, before departing Ireland earlier than scheduled for Britain, due to the Icelandic ash cloud.